“What are you going to do next?” Jim McIngvale’s football coach asked at the end of the season in 1972. Despite lack of size and speed, McIngvale had become a team captain, in his senior year, through determination and drive. “I’m thinking about opening a health club,” McIngvale replied. A few years later, though, with the health club business a failure, McIngvale was left jobless and penniless. He didn’t even have a car. Needing a job, McIngvale began working as a furniture salesman in Dallas, and that’s when he discovered his calling. In June 1981, newlyweds Jim and Linda McIngvale moved to Houston. The Houston oil industry was booming, and McIngvale watched as scores of U-Haul trucks headed into the city. He reasoned that many of the people would need furniture for their new homes. With $5000 in savings, McIngvale and his wife opened Gallery Furniture in a tent on the North Freeway. At first, they could not afford to hire a single employee. They bought furniture from a Dallas warehouse and hauled it to Houston overnight in a rented van. They slept on the floor of the store and opened at first light to sell the merchandise. They offered fair prices and immediate, same-day delivery. On a shoestring budget, and without debt, Gallery Furniture grew and became successful. As the store prospered, McIngvale began to give back to the community. Then came the oil-bust of the mid-1980s. McIngvale took his last $10,000 and plunked it down for a television ad. The advertising bet nearly went sour. After three hours of taping, he had nothing worth putting on air. The producer told him to give it one more try. Under pressure, he gave a fast-talking spiel for Gallery Furniture: great prices, quality furniture, immediate delivery. The line would become legendary, but there was still one more hurdle to cross. The ad was run on late-night television and Gallery Furniture experienced a spike in sales. McIngvale admits that his early success came from knowing little about the furniture business. This forced him to find new approaches to the retail business. In the beginning, Gallery Furniture, like most furniture stores, paid its sales staff on commission. McIngvale ended this practice in 1990, after studying the work of management guru Edward R. Deming. Deming taught that workers should be rewarded and encouraged to take pride in their work, not just drive sales volume. Today, Gallery’s unique “no-hype” approach to consumer education wins praise from customers and furniture industry experts alike. McIngvale also learned from Deming the practice of developing long-term relationships with just a few suppliers. These relationships are noticeable throughout the store, not least in the high-quality solid wood furniture Gallery carries, sourced directly from Amish craftsmen. 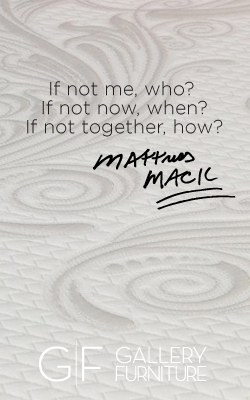 Gallery’s special care in choosing suppliers is also reflected in its new Mack-O-Pedic line of mattresses, which are not available anywhere else. These unique practices have allowed Gallery Furniture to become one of the most successful furniture stores in the country. Today, Gallery ranks among the top 100 private companies in Houston. Gallery is also among the top 100 furniture stores in the USA. Measured by sales per square foot, a key indicator in the retail industry, Gallery Furniture has been the #1 furniture store in America for over a decade, according to Furniture Today. McIngvale credits this success to taking the road less traveled. He’s implemented new methods that are now considered best practices. Meanwhile, Gallery’s customers receive top service because of stellar employees who take exceptional pride in their work. Visit Gallery Furniture’s I-45 location on most days, and chances are you’ll see McIngvale when you enter the store. He often works 16-hour days, and for many of those hours you’ll find him standing at his desk near the entrance of the store. He uses this position to keep a steady eye on the action, and ensure that everyone who comes to the store has a great experience. Through his television ads, McIngvale has become a local celebrity over the years. Often, people come to the store, approach his desk, and ask to have their picture taken with him. As McIngvale’s stature has grown over the years, he’s been increasingly sought as a business and motivational speaker. If he’s not at his desk when you visit Gallery Furniture’s I-45 location, chances are he’s delivering a talk on the blessings of American free enterprise, or how to succeed as an entrepreneur. Since Gallery Furniture first opened its doors in 1981, McIngvale and his wife have given money and furniture to countless charities and needy families. Each year, Gallery’s Christmas Giveaway awards needy families and individuals with furniture during the Christmas season. This year, the program entered its 30th year. Gallery Furniture also supports Teachers’ Lounge Makeovers, the USO, the Houston Rodeo, the Salvation Army, Houston’s Mobile Stroke Unit (the first of its kind in the USA), and many other charities. With Gallery Furniture’s new location in Richmond, Texas, opening this spring, the store will include a section showcasing artistic works created by special needs residents of the Brookwood Community in Brookshire, Texas. “We call our approach ‘capitalism with a cause.’ We sell some furniture while always finding a way to give back to the community,” McIngvale says. What can a guy possibly give a person who is so generous and so darn thoughtful – a guy like you?? The answer is ‘I don’t know but here’s a feeble attempt – a souvenir photo of two Presidents.’ I hope you and yours have a wonderful Christmas, a great bowl game, and your best New Year ever. We believe that faith in God and freedom go hand-in-hand, and that without faith this experiment in self-government known as America cannot work. We believe in the power of neighbors helping neighbors, by which generations of Americans have preserved and thrived. We believe in the American work ethic, for it is only through hard work and the blessings of God that dreams are realized. We believe that one of life’s supreme joys is the joy of giving back.